I know, a lot of you were probably expecting me to wrap up Wave 3 of DC Icons today on DC Friday. Pfft… like I’m going to buy Aquaman! Kidding! Kidding! Of course, I picked up Aquaman and he’s a fantastic figure. Truth be told, I’ve had a busy week and I didn’t have enough time to do Aquaman justice, so I opted to take a little detour and check out another one of the DC Animated Movie Series by DC Collectibles. These are pretty simple figures and don’t take nearly as long for me to look at. So let’s have a look at Batman from the Son of Batman movie! Hopefully his arm won’t fall off like Green Lantern’s did. It’s confession time! I haven’t seen Son of Batman yet, but I hear it’s pretty good. 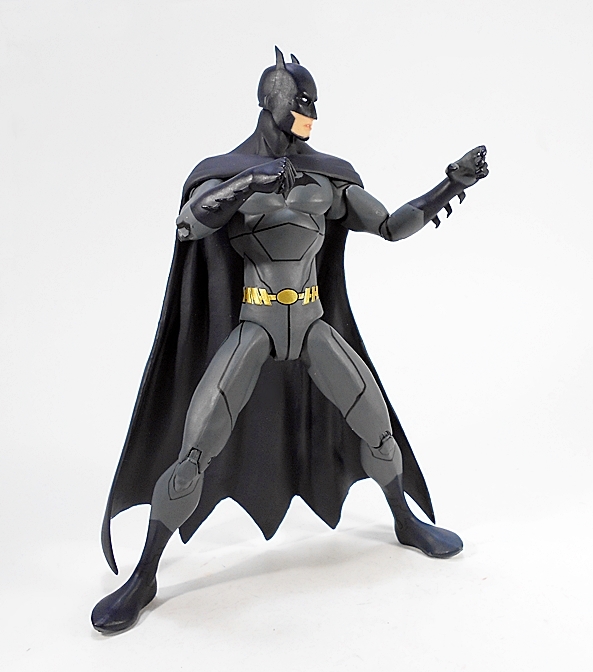 I actually bought this figure as a stand in for a Justice League War Batman that was never produced. 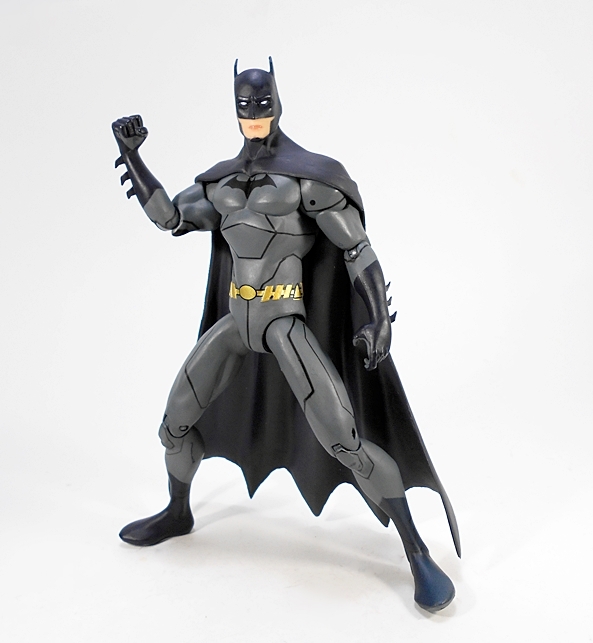 Regardless, the figure comes carded in the same style as the JLW figures only with Son of Batman on the front insert and stills from the movie on the card behind the figure. The back of the card shows other figures in the line: Robin, Nightwing, and Deathstroke. If you’ll give me a moment, I’ll say a quick prayer to the QC Gods and get Bats out of his package. Alright! 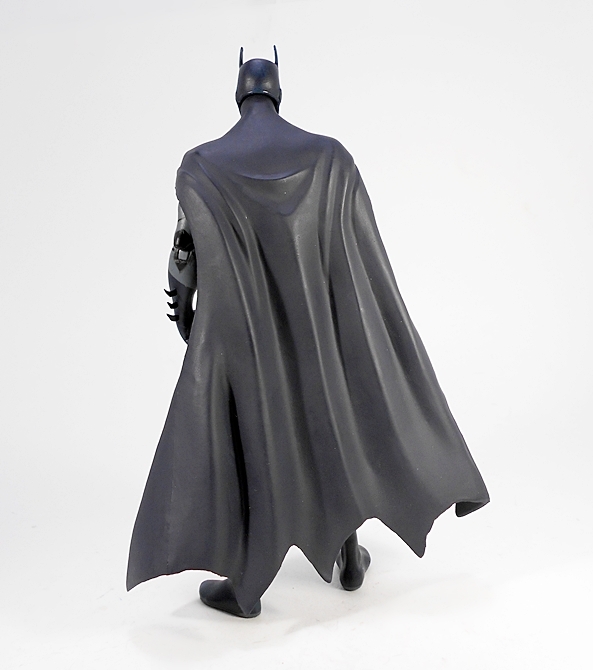 I’m happy to report that Batman made it out of the package without any breakage and looking pretty sharp. I was expecting a recycled buck from the JLW Hal Jordan or Barry Allen, but Batman looks mostly new. 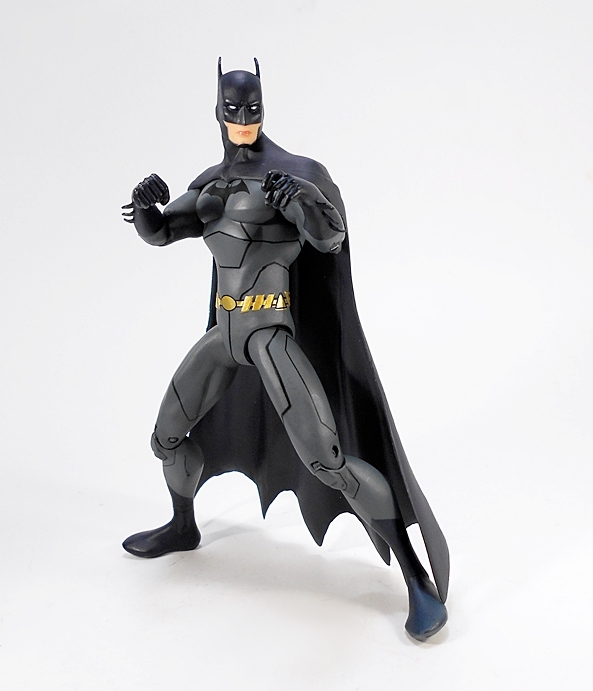 The overall shape and style of the body is similar, but Batman lacks the detailed muscles in the abs, making this look more like light armor. Most of the costume is achieved through paint apps. 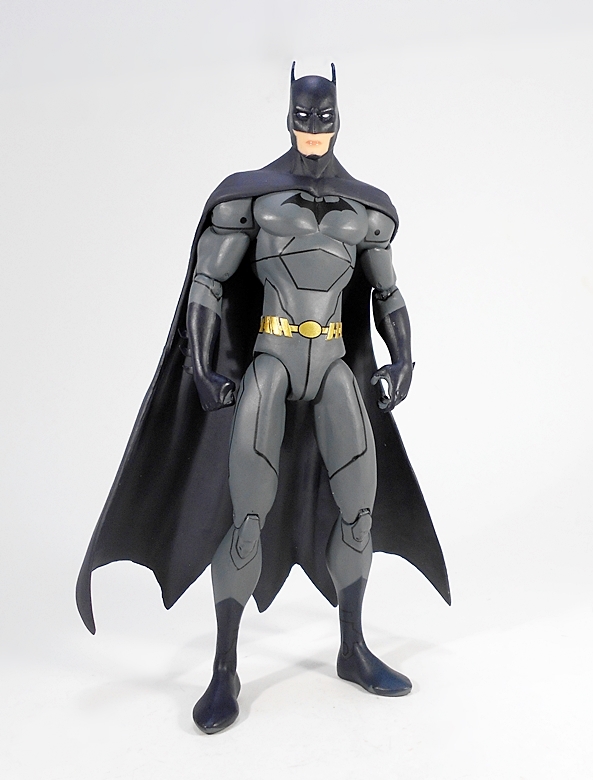 It’s a very dark charcoal gray with black painted panel lines, boots, gloves, and bat symbol on the chest. The gold belt is a mix of sculpt and paint and looks pretty good.In fact, all the paint on this figure is quite solid. The cape is particularly well done. I love the way it covers the shoulders rather tightly, it fans out just the right amount, and the scalloped edges end just a bit above the ground, so it’s not dragging. Nice! The head sculpts have been hit or miss in this line. We’ve had the sloppy Hal Jordan, the deformed Superman, and a pretty solid Wonder Woman and Cyborg. I’m happy to report that Batman can be counted with the better ones. 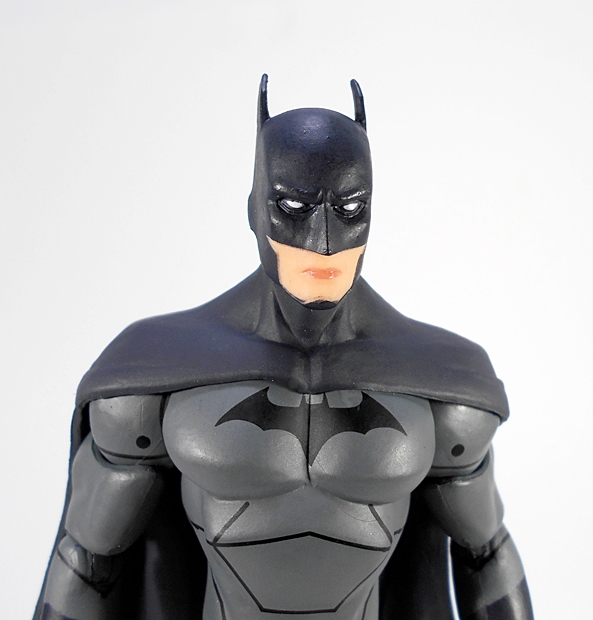 Not only is the cowl excellent, but the exposed part of the face is clean and sharp and actually looks great. The articulation on these figures is the same throughout all the male bucks. It’s OK, but not great. 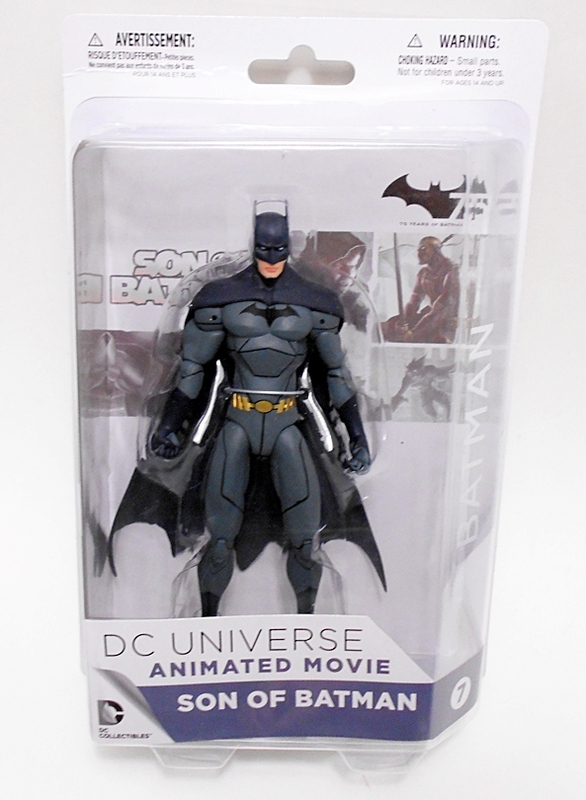 It’s loads better than what we used to get from DC Direct, but not quite up to snuff with the other modern DC Collectibles lines. You get rotating hinges in the shoulders and elbows, hinges in the knees, ball joints in the hips, and a ball joint in the neck. A couple of my figure’s joints were a little tight out of the package, but I was able to coax everything into moving without breaking. That’s it! I said today was going to be quick and it was. 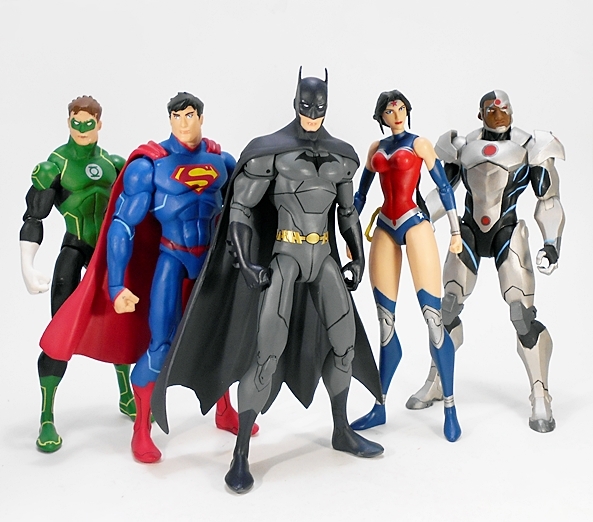 I’d rate Batman among the best of these figures so far, or at least of the ones I’ve already opened. The stylized sculpt suits him beautifully, the paint is sharp and neat, the portrait is solid, and I’ve really got nothing at all to complain about. Well… at $20, the original price is a bit high for what you’re getting here, but I’ve been picking these up for ten bucks a pop, and I’m certainly satisfied here.So far, the best I can say is that I’d be happy to just own this one and Wonder Woman as stylized stand alone figures, but it’s not a line I’d recommend at anything other than deep discounts.